Epicurus (;Greek : ???????? ?, Epíkouros, “ally, comrade”; 341270 BC) was an ancient Greek philosopher who founded the school of philosophy called Epicureanism. Only a few fragments and letters of Epicurus’s 300 written works remain. Much of what is known about Epicurean philosophy derives from later followers and commentators. For Epicurus, the purpose of philosophy was to attain the happy, tranquil life, characterized by ataraxiapeace and freedom from fearand aponiathe absence of painand by living a self-sufficient life surrounded by friends. He taught that pleasure and pain are measures of what is good and evil; death is the end of both body and soul and therefore should not be feared; the gods neither reward nor punish humans; the universe is infinite and eternal; and events in the world are ultimately based on the motions and interactions of atoms moving in empty space. His parents, Neocles and Chaerestrate, both Athenian-born, and his father a citizen, had emigrated to the Athenian settlement on the Aegean island of Samos about ten years before Epicurus’s birth in February 341 BC. As a boy, he studied philosophy for four years under the Platonist teacher Pamphilus. At the age of eighteen, he went to Athens for his two-year term of military service. The playwright Menander served in the same age-class of the ephebes as Epicurus. After the death of Alexander the Great, Perdiccas expelled the Athenian settlers on Samos to Colophon, on the coast of what is now Turkey. After the completion of his military service, Epicurus joined his family there. He studied under Nausiphanes, who followed the teachings of Democritus. In 311/310 BC Epicurus taught in Mytilene but caused strife and was forced to leave. He then founded a school in Lampsacus before returning to Athens in 306 BC where he remained until his death. There he founded The Garden (????? ), a school named for the garden he owned that served as the school’s meeting place, about halfway between the locations of two other schools of philosophy, the Stoa and the Academy. Epicurus’s teachings were heavily influenced by those of earlier philosophers, particularly Democritus. Nonetheless, Epicurus differed from his predecessors on several key points of determinism and vehemently denied having been influenced by any previous philosophers, whom he denounced as “confused”. Instead, he insisted that he had been “self-taught”. Epicurus emphasised friendship as an important ingredient of happiness, and the school resembled in many ways a community of friends living together. However, he also instituted a hierarchical system of levels among his followers, and had them swear an oath on his core tenets. Epicurus is a key figure in the development of science and scientific methodology because of his insistence that nothing should be believed, except that which was tested through direct observation and logical deduction. He was a key figure in the Axial Age, the period from 800 BC to 200 BC, during which, according to Karl Jaspers, similar thinking appeared in China, India, Iran, the Near East, and Ancient Greece. His statement of the Ethic of Reciprocity as the foundation of ethics is the earliest in Ancient Greece, and he differs from the formulation of utilitarianism by Jeremy Bentham and John Stuart Mill by emphasising the minimisation of harm to oneself and others as the way to maximise happiness. Epicurus’s teachings represented a departure from the other major Greek thinkers of his period, and before, but was nevertheless founded on many of the same principles as Democritus. Like Democritus, he was an atomist, believing that the fundamental constituents of the world were indivisible little bits of matter (atoms; Greek: ?????? atomos, “indivisible”) flying through empty space (Greek: ????? kenon). Everything that occurs is the result of the atoms colliding, rebounding, and becoming entangled with one another. His theory differs from the earlier atomism of Democritus because he admits that atoms do not always follow straight lines but their direction of motion may occasionally exhibit a “swerve” (Greek: ??????????? parenklisis; Latin: clinamen). This allowed him to avoid the determinism implicit in the earlier atomism and to affirm free will. He regularly admitted women and slaves into his school and was one of the first Greeks to break from the god-fearing and god-worshipping tradition common at the time, even while affirming that religious activities are useful as a way to contemplate the gods and to use them as an example of the pleasant life. Epicurus participated in the activities of traditional Greek religion, but taught that one should avoid holding false opinions about the gods. The gods are immortal and blessed and men who ascribe any additional qualities that are alien to immortality and blessedness are, according to Epicurus, impious. The gods do not punish the bad and reward the good as the common man believes. The opinion of the crowd is, Epicurus claims, that the gods “send great evils to the wicked and great blessings to the righteous who model themselves after the gods,” whereas Epicurus believes the gods, in reality, do not concern themselves at all with human beings. Epicurus’ philosophy is based on the theory that all good and bad derive from the sensations of what he defined as pleasure and pain: What is good is what is pleasurable, and what is bad is what is painful. His ideas of pleasure and pain were ultimately, for Epicurus, the basis for the moral distinction between good and evil. If pain is chosen over pleasure in some cases it is only because it leads to a greater pleasure. Although Epicurus has been commonly misunderstood to advocate the rampant pursuit of pleasure, his teachings were more about striving for an absence of pain and suffering, both physical and mental, and a state of satiation and tranquillity that was free of the fear of death and the retribution of the gods. Epicurus argued that when we do not suffer pain, we are no longer in need of pleasure, and we enter a state of ataraxia, “tranquillity of soul” or “imperturbability”. Epicurus’ teachings were introduced into medical philosophy and practice by the Epicurean doctor Asclepiades of Bithynia, who was the first physician who introduced Greek medicine in Rome. Asclepiades introduced the friendly, sympathetic, pleasing and painless treatment of patients. He advocated humane treatment of mental disorders, had insane persons freed from confinement and treated them with natural therapy, such as diet and massages. His teachings are surprisingly modern, therefore Asclepiades is considered to be a pioneer physician in psychotherapy, physical therapy and molecular medicine. Epicurus explicitly warned against overindulgence because it often leads to pain. For instance, Epicurus warned against pursuing love too ardently. He defended friendships as ramparts for pleasure and denied them any inherent worth. He also believed, contrary to Aristotle, that death was not to be feared. When a man dies, he does not feel the pain of death because he no longer is and therefore feels nothing. Therefore, as Epicurus famously said, “death is nothing to us.” When we exist, death is not; and when death exists, we are not. All sensation and consciousness ends with death and therefore in death there is neither pleasure nor pain. The fear of death arises from the belief that in death, there is awareness. From this doctrine arose the Epicurean epitaph: Non fui, fui, non sum, non curo (“I was not; I was; I am not; I do not care”), which is inscribed on the gravestones of his followers and seen on many ancient gravestones of the Roman Empire. This quotation is often used today at humanist funerals. Epicuruss old questions are yet unanswered. Is he willing to prevent evil, but not able? then is he impotent. Is he able, but not willing? then is he malevolent. Is he both able and willing? whence then is evil? No extant writings of Epicurus contain this argument and it is possible that it has been misattributed to him. Further, this too should be said. Anyone who asserts that god exists either says that god takes care of the things in the cosmos or that he does not, and, if he does take care, that it is either of all things or of some. Now if he takes care of everything, there would be no particular evil thing and no evil in general in the cosmos; but the Dogmatists say that everything is full of evil; therefore god shall not be said to take care of everything. On the other hand, if he takes care of only some things, why does he take care of these and not of those? For either he wishes but is not able, or he is able but does not wish, or he neither wishes nor is able. If he both wished and was able, he would have taken care of everything; but, for the reasons stated above, he does not take care of everything; therefore, it is not the case that he both wishes and is able to take care of everything. But if he wishes and is not able, he is weaker than the cause on account of which he is not able to take care of the things of which he does not take care; but it is contrary to the concept of god that he should be weaker than anything. Again, if he is able to take care of everything but does not wish to do so, he will be considered malevolent, and if he neither wishes nor is able, he is both malevolent and weak; but to say that about god is impious. Therefore, god does not take care of the things in the cosmos. Epicurus emphasised the senses in his epistemology, and his Principle of Multiple Explanations (“if several theories are consistent with the observed data, retain them all”) is an early contribution to the philosophy of science. In contrast to the Stoics, Epicureans showed little interest in participating in the politics of the day, since doing so leads to trouble. He instead advocated seclusion. This principle is epitomised by the phrase lathe bi?sas (???? ?????? ), meaning “live in obscurity”, “get through life without drawing attention to yourself”, i.e., live without pursuing glory or wealth or power, but anonymously, enjoying little things like food, the company of friends, etc. Plutarch elaborated on this theme in his essay Is the Saying “Live in Obscurity” Right? (?? ????? ??????? ?? ???? ????? ?, An recte dictum sit latenter esse vivendum) 1128c; cf. Flavius Philostratus, Vita Apollonii 8.28.12. The atomic poems (such as ‘All Things are Governed by Atoms’) and the philosophy of naturalism espoused by Margaret Cavendish were influenced by Epicurus. His emphasis on minimising harm and maximising happiness in his formulation of the Ethic of Reciprocity was later picked up by the democratic thinkers of the French Revolution, and others, like John Locke, who wrote that people had a right to “life, liberty, and property.” To Locke, one’s own body was part of one’s property, and thus one’s right to property would theoretically guarantee safety for one’s person, as well as one’s possessions. This triad, as well as the egalitarianism of Epicurus, was carried forward into the American freedom movement and Declaration of Independence, by the American founding father, Thomas Jefferson, as “all men are created equal” and endowed with certain “unalienable rights,” such as “life, liberty, and the pursuit of happiness.” Jefferson considered himself an Epicurean. Karl Marx‘s doctoral thesis was on The Difference Between the Democritean and Epicurean Philosophy of Nature. Epicurus was first to assert human freedom as coming from a fundamental indeterminism in the motion of atoms. This has led some philosophers to think that for Epicurus free will was caused directly by chance. In his On the Nature of Things (De rerum natura), Lucretius appears to suggest this in the best-known passage on Epicurus’ position. But in his Letter to Menoeceus, Epicurus follows Aristotle and clearly identifies three possible causes – “some things happen of necessity, others by chance, others through our own agency.” Aristotle said some things “depend on us” (eph’hemin). Epicurus agreed, and said it is to these last things that praise and blame naturally attach. 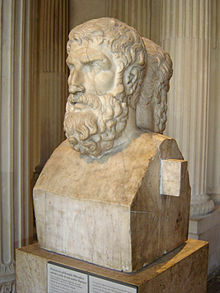 For Epicurus, the “swerve” (or clinamen) of the atoms simply defeated determinism to leave room for autonomous agency. Epicurus was also a significant source of inspiration and interest for both Arthur Schopenhauer, having particular influence on the famous pessimist’s views on suffering and death, as well as one of Schopenhauer’s successors: Friedrich Nietzsche. Nietzsche cites his affinities to Epicurus in a number of his works, including The Gay Science, Beyond Good and Evil, and his private letters to Peter Gast. Nietzsche was attracted to, among other things, Epicurus’ ability to maintain a cheerful philosophical outlook in the face of painful physical ailments. Nietzsche also suffered from a number of sicknesses during his lifetime. However, he thought that Epicurus’ conception of happiness as freedom from anxiety was too passive and negative. The only surviving complete works by Epicurus are three letters, which are to be found in book X of Diogenes Laërtius‘ Lives of Eminent Philosophers, and two groups of quotes: the Principal Doctrines (?????? ????? ), reported as well in Diogenes’ book X, and the Vatican Sayings, preserved in a manuscript from the Vatican Library. Numerous fragments of his thirty-seven volume treatise On Nature have been found among the charred papyrus fragments at the Villa of the Papyri at Herculaneum. In addition, other Epicurean writings found at Herculaneum contain important quotations from his other works. Moreover, numerous fragments and testimonies are found throughout ancient Greek and Roman literature, a collection of which can be found in Usener‘s Epicurea. According to Diskin Clay, Epicurus himself established a custom of celebrating his birthday annually with common meals, befitting his stature as heros ktistes (or founding hero) of the Garden. He ordained in his will annual memorial feasts for himself on the same date (10th of Gamelion month). Epicurean communities continued this tradition, referring to Epicurus as their “saviour” (soter) and celebrating him as hero. Lucretius apotheosized Epicurus as the main character of his epic poem De rerum natura. The hero cult of Epicurus may have operated as a Garden variety civic religion. However, clear evidence of an Epicurean hero cult, as well as the cult itself, seems buried by the weight of posthumous philosophical interpretation. Epicurus’ cheerful demeanour, as he continued to work despite dying from a painful stone blockage of his urinary tract lasting a fortnight, according to his successor Hermarchus and reported by his biographer Diogenes Laërtius, further enhanced his status among his followers. Paul the Apostle encountered Epicurean and Stoic philosophers as he was ministering in Athens. Horace describes himself as Epicuri de grege porcum “a swine from Epicurus’s herd” in his Epistles. In Canto X Circle 6 (“Where the heretics lie”) of Dante‘s Inferno, Epicurus and his followers are criticised for supporting a materialistic ideal when they are mentioned to have been condemned to the Circle of Heresy. Chaucer’s Frankeleyn, in the General Prologue of his Canterbury Tales, is described as an Epicurean: “Wel loved he by the morwe a sop in wyn; / To lyven in delit was evre his wone, / For he was Epicurus owene sone, / That heeld opinioun that pleyn delit / Was verray felicitee parfit” (344-38). Epicurus the Sage is a two-part comic book by William Messner-Loebs and Sam Kieth portraying Epicurus as “the only sane philosopher” by anachronistically bringing him together with many other well-known Greek philosophers. It was republished as graphic novel by the Wildstorm branch of DC Comics. In Rabbinic literature the term Epikoros is used, without a specific reference to Epicurus, yet it seems apparent that the term was derived from his name. Epicurus’s apparent hedonistic views (as Epicurus’ ethics was hedonistic) and philosophical teachings, though opposed to the Hedonists of his time, countered Jewish scripture, the strictly monotheistic conception of God in Judaism and the Jewish belief in the afterlife and the world to come. The Talmudic interpretation is that the Aramaic word is derived from the root-word ??”? (PKR; lit. licentious), hence disrespect. The Christian censorship of the Jewish Talmud in the aftermath of the Disputation of Barcelona and during the Spanish Inquisition and Roman Inquisition, let the term spread within the Jewish classical texts, since Roman Catholic Church censors replaced terms like Minim (“sectarians”, coined on the Christians) with the term Epikorsim or Epicursim, meaning heretics.